With small businesses skittish about the economy, Transit Connect sales have been modest. So Ford is looking to sell the cargo van in other market segments, such as to sports enthusiasts. 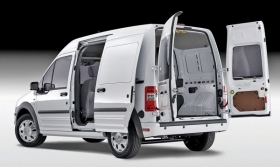 Ford Transit Connect sales are sluggish as small-business owners, nervous about the economy, hold off on purchasing. Bob Wheat sees unusual uses for the Ford Transit Connect small cargo truck. Some people want it for wheelchairs, and sports enthusiasts want to carry their gear, says Wheat, general manager of Village Ford in Dearborn, Mich.
"We sold one to our body shop employee, and he's making a camper out of it," Wheat says. But the vehicle's core audience -- small-business owners -- are nervous about the economy, and sales of the vehicle have been modest. So the jury's out on whether small, European-style commercial vehicles will catch on with U.S. customers. Ford Motor Co. hopes the vehicle will appeal to a broader audience. "Confidence among small-business owners is very cautious right now," says Ford sales analyst George Pipas. Businesses "are not in a position to turn over their whole fleet, but they've bought some to see just how they can use them in their business." A total of more than 600,000 Transit Connects have been sold in seven years in 55 countries. U.S. sales started in July. The vehicle is 181 inches long, 10 inches shorter than the Ford Fusion sedan. Damoni Hurt, Transit Connect marketing manager, sees potential beyond small-business owners. "There are untapped markets out there that we're still trying to hone in on, like the sport enthusiast, the aftermarket 'trick my ride' niche," Hurt says. "There is upward growth because we're in a new segment." Since July, Ford has sold 6,842 Transit Connects in the United States. At the end of November, Ford had 14,100 of the vehicles in inventory, which is about a 200-plus days supply, Pipas says. Because of the slow sales, Ford is trimming planned production by "a few thousand" in the first half of 2010, he says. Ford builds the Transit Connect in Turkey. In November, Ford took the truck to an event in Las Vegas for bicyclists. "We dipped our toe into the sports-enthusiast market," Hurt says. "We wanted to gauge the demand." But the main audience for the Transit Connect remains small-business owners, who can choose from 15 packages to tailor the vehicle to their needs. The truck, which starts at $21,475 including shipping, also gets better fuel economy -- 22 mpg city, 25 highway -- than many large commercial vehicles, such as vans and pickups. Wheat says one of his small-business customers traded in a Ford Econoline van for a Transit Connect. That customer is now saving $120 in gasoline every two weeks, Wheat says. The Transit Connect is powered by a 136-hp inline-four engine. For now, Ford owns the small-cargo-truck segment. But in 2012, Chrysler Group's Ram brand plans to start selling a version of the Fiat Doblo compact van.